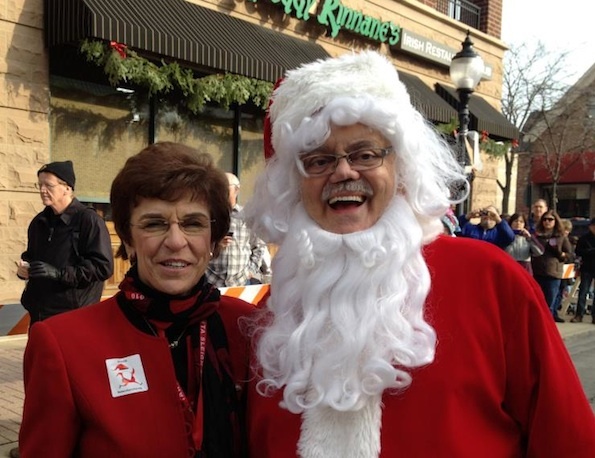 Santa Rohrman and Mayor Mulder (See over 100 more photos). 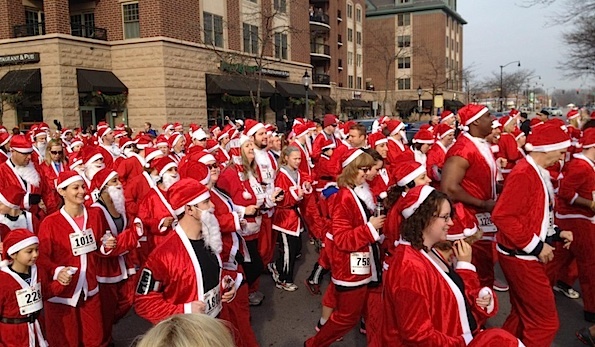 Race organizers were sure they had a record on their hands — not a land speed record, but the number of participants in the Annual Rotary Santa Run Saturday, December 1, 2012. Prior to race day, registration was already over 1700 participants. The Fifth Annual Rotary Santa Run, which felt more like northern California in December than Arlington Heights, did bring in a record number of participants — over 2,000. After warm wishes from honorary Santa/sponsor Bob Rohrman and Mayor Arlene Mulder, the starter’s pistol was fired by Arlington Heights Police Captain Nicholas Pecora, and the runner’s and walkers were off to the tune of Bing Crosby’s “Here Comes Santa Claus”. Music was provided by The Cardinal — Arlingtoncardinal.com parked at Vail Avenue and Campbell Street. A little laughter was heard when “Let it Snow” by Chicago was played. The proceeds from this year’s event will be used to further Rotary International’s efforts to eradicate polio worldwide. Rich Daubert paced first overall with a time of 16:33.6 (5:20 pace). The first woman to place was Jennifer Benitez — 30th overall — with a time of 20:27 (6:36 pace). 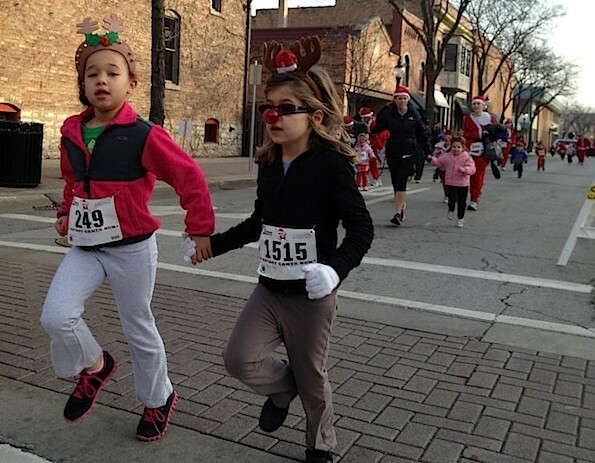 Two girls hand-in-hand run the Reindeer Run sprint on Campbell Street from Highland Avenue to Dunton Avenue and back to Highland Avenue (See over 100 more photos). 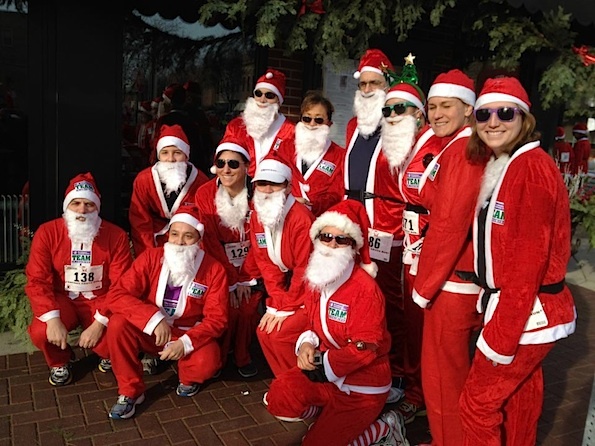 Group Santas pose for pictures before the run (See over 100 more photos). Runners leave the starting line eastbound on Campbell Street at Vail Avenue (See over 100 more photos). 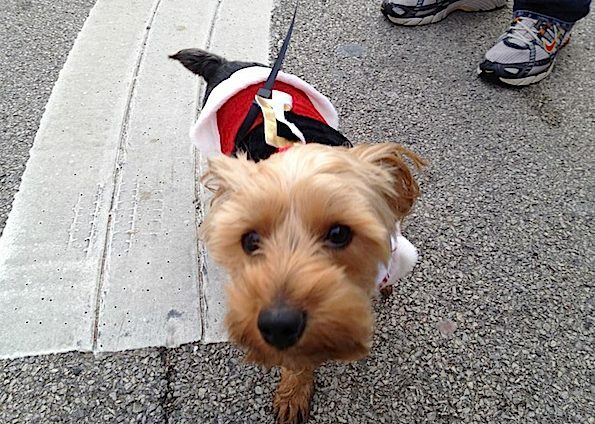 Santa Dog (See over 100 more photo).